We researched dozens of industry-leading mountaineering backpacks and tested several of the most promising and exciting models. Then we took them into the field for our rigorous testing, in exactly the environment they are built for. We climbed remote alpine peaks and cold waterfall ice routes, hauled heavy loads to basecamps, and dragged sleds full of expedition gear. We even scraped them around at our favorite rock climbing crags for good measure. We then scored each for its performance in our set of assessment metrics. Read on to see what our field notes revealed about each pack's performance. If you're looking for a highly abrasion resistant pack suitable for multi-pitch climbs, head over to our climbing pack review. This is an excellent pack for most mountaineering uses, excelling in comfort and versatility, and climbs very well. The Ascensionist is a master of technical ascents with its light weight, versatility, and comfort on the climb. An excellent, versatile mountaineering pack that carries a lot but still feels nimble enough for technical ascents. This is a light and durable pack which is a pleasure to use, and quickly became our go-to for a wide variety of climbing adventures. This is a very comfortable and lightweight pack with a few hangups in ease of access and durability. For the second year in a row, our Editor's Choice Award goes to the impressive Osprey Packs Mutant 38. The pack's current mutation is even better than the last, improving utility, versatility, durability, and climbing comfort. This is a pack that morphs from a gear-hauling beast to a light and nimble summit pack in mere moments. It has an excellent suspension for heavier loads and logical and useful climbing features for technical pitches. Climbers still retain some skepticism toward Osprey as a manufacturer of technical climbing packs. We did, too. They have produced many packs with too many features and so many straps they slap you in the face when you're on the hardest part of the climb. This pack has more features than some, such as the Arc'teryx Alpha FL 45 and the Patagonia Ascensionist 40, but it can be slimmed down, making it competitive with the simplest and lightest packs in this review. Overall, this is an excellent update to an already awesome mountaineering pack. Our Best Buy Award goes to the Patagonia Ascensionist 40. Sure it's usually slightly more expensive than our overall winner, the Osprey Mutant, but it's so versatile that it offers a slightly better value. This is an excellent mountaineering backpack for a variety of uses. It strikes a middle ground between the other two winners, the fully featured Mutant and the streamlined Arc'teryx Alpha. It has a few extra features like side straps, small hip pads, and a useful zippered top-access pocket, but they come with minimal weight and complexity penalties. This pack is comfortable when loaded down for the approach and lightweight and graceful on technical climbs. The Ascensionist makes some compromises. If you want the absolute lightest pack, the most comfortable option for a long haul, or a little more capacity, you might look to our other award winners. But for a true Pack-of-all-Trades, this one does very well. Our Top Pick Award for Bigger Objectives goes to the Black Diamond Mission 75. This is an excellent mountaineering pack for lightweight or shorter expeditions. It far exceeded our expectations for climbing comfort on technical or steep terrain. This is a pack we could take on long glacial approaches, easily use for ski mountaineering, and then strip down for alpine ice and rock routes. The features are very well thought out and match the purposes of the pack very well. The side access zipper and external crampon pouch allowed us to set out for long days and adjust quickly to the changing mountain environment. This pack carries phenomenally well for a 75-liter pack. It felt and looked more liked a 60-liter pack since an expandable collar gives it the extra 15 liters. That said, it's still a large pack. It is not nimble enough for many mere mortals to use on long, steep rock climbs. It also tends to carry a bit more weight on the shoulders, which we could feel on our longer walks. Overall though, this is a highly versatile pack for bigger trips and can adjust to an impressive variety of terrain. Our Top Pick Award for Fast-and-Light goes to the Arc'teryx Alpha FL 45. It's the third time the Alpha has won an award in our reviews. This mountaineering backpack rewards the savvy packer with an excellent weight-to-volume ratio and impressive durability, especially for its ultra lightweight. We think of it as a 30-liter pack that can be overstuffed with light, bulky items for a short hike to basecamp when minimizing weight on the climb is a top priority. It is perfect for car-to-car alpinism, and manageable for 1-3 night trips in the summer if you have a very light bivy kit. This pack is a dream on technical climbs. The fabric is extremely durable and can even stand up to some light hauling. The pack makes some compromises to achieve such impressive climbing comfort at such a lightweight. This is not a fully featured pack, so it requires some fiddling and creativity if you want to attach things like pickets, trekking poles, or skis (not recommended). To get to base camp, you'll need to pack very mindfully to make sure it carries comfortably — and it'll only work if you have a very lightweight kit. This is a niche pack best suited to technical alpine routes with mixed ice and rock, so it's not the most versatile in this review. But it is the mountaineering backpack of choice for alpinists who want to do more with less. It's the model our testers consistently pulled out of the pile when gearing up for difficult routes. We give the Gregory Denali 100 our Top Pick for Expeditions Award. It shines for its comfort and versatility. We appreciate the Denali for how comfortably it sits on your back. Where it rises above your head, it does not impinge upon your view or range of motion. We also liked the snow-specific features on the Denali since most packs of this size are likely to encounter snow at some point during an expedition. And, when packed well, it feels secure and streamlined while still allowing easy access to items with large zippered sleeves and pockets. It's not a featherweight pack meant for a wide variety of expeditions. Gregory built it for Denali, and it does its job well. The Bugaboos were a great testing ground for the updated Mutant 38. This is a review of mountaineering backpacks for technical alpine climbing. The packs are equipped with features useful for everything from traditional mountaineering with ice axes and crampons to alpine rock climbs, ice climbs, and even ski mountaineering. The main difference between these packs and backpacking packs is in the feature set. These packs are made to carry specific for crampons, ice axes, ice tools, ropes and more. They also vary in their shape, size, and carrying comfort. Mountaineering packs are often identifiable by their svelte exterior. They sport minimal straps and loose flappy things to whack you in the face when it's windy up high on a ridge climb. These packs are more streamlined and hug close to your body to improve mobility and climbing comfort, and they are made of light but durable materials. The ideal alpine climbing pack for most venues in the U.S. needs to be relatively easy to overstuff with several days worth of food and basecamp comforts. Then it must be easy to slim down for your technical summit climb. We want this pack to be streamlined for climbing, but we don't want to so beat up from carrying an awkward load to basecamp that we are aching during the climb itself. These packs don't have lots of pockets, access points, straps, or beefy suspension. If that's what you're looking for, check out women's or men's backpack review. We scored each mountaineering backpack on the criteria detailed below using a standard scale of 10. We selected a wide range of mountaineering packs for this review. 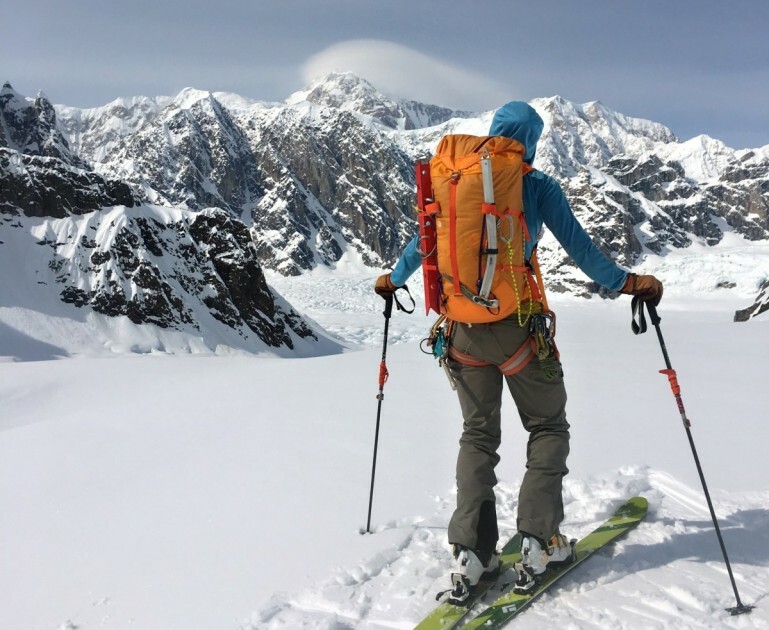 We recognize that alpine climbs come in all shapes and sizes and offer a glimpse into some of the best packs for everything from in-a-day alpine missions to weeks-long expeditions. Most of the packs in this review are in the 30-50 liter range, which is a great all-rounder size. But, you'll find a few outliers, notably the Gregory Denali expedition pack, and some "tweeners" as well. All this is to say — there are a lot of caveats and tradeoffs in choosing a mountaineering pack, so be sure you're applying the right tool for the task. Each review thoroughly discusses the best applications for each pack and can point you in the right direction for your climbing passions. Our performance scores shake out the best packs from the mediocre ones. The best rise just like cream to the top of the chart. But our metrics do not take price into account—we want to know what the best packs are without biasing our assessment for or against due to the price tag. Our Editor's Choice Award-winning Osprey Mutant offers excellent value, but we think the Patagonia Ascentionist is the real ringer here. It excels at everything from laidback crag days to hard-core summit bids, significantly cutting back the number of packs you may consider buying. Fast and light alpinism on Mt. Baker's North Ridge. Mountaineering is a physically and technically demanding sport. You need to have everything necessary to survive the harsh mountain environment with you at all times. But if you carry too much weight or a load that's too bulky, you can strain your endurance or compromise your balance on technical maneuvers. This makes the weight of your pack and the volume it can comfortably carry of the utmost importance. Stripped Weight — Sometimes you may want to consider the stripped weight of a pack. This is the weight of the pack minus any removable components like a lid (aka brain), hip belt, or frame sheet. This is decreasing in importance as more and more pack manufacturers are eliminating the lids, minimizing hip belts, and sewing the frame sheet in place. That is to say, more and more often you're starting with the stripped down model. We have adjusted some of our scores to avoid penalizing packs that have more features but can still be stripped down to minimize weight. The HMG 3400 Ice Pack at it's "ideal" volume (left) and "max" volume (right). In our comparison table below, we list each pack's weight-to-volume ratio. But we didn't take the manufacturer's word for it. We measured the volume ourselves with the help of hundreds of ping-pong balls to get an apples-to-apples (or pings-to-pongs) sense of what each pack could handle. We also measured the weights ourselves, with a digital scale. Find out more details about our elaborate ping-pong ball test in our How We Test article. Because these packs do not all have the same volume, a smaller model of heavier materials could be lighter than a more substantial contender built from lighter weight materials. We use a weight-to-volume ratio because it lets us fairly compare the weights pack weight irrespective of pack size. We measure weight in grams (g) and volume in liters (L) and only measured the capacity of the main compartment, not the lid or any pockets because loading pockets can throw off the pack's balance. Plus this helped normalize the measurement across all manufacturers, as some report volume including pockets, and others without. This score shakes out when we get to features, where packs with lots of pockets scored higher in an objective sense. If you hate pockets, you can look with skepticism upon a highly featured pack. The Alpha 45 couldn't easily fit our standard 2-3 day climbing kit, but if we thoughtfully trimmed things down and took only a small inflatable pad, it worked just fine. For a more realistic test, we also put together a sample kit for a weekend of summer alpine climbing. We then packed this gear into each of the packs. While this was less useful for the expedition packs, which gobbled up all the equipment and then some, it provides a known quantity — and a visual aid for comparison. It also helped us to suss out attachment systems for crampons, ice axes, helmets, poles, rope, etc. Because weight is the first thing to consider when selecting gear for alpine climbing and mountaineering, it's the first of our scoring criteria and receives the highest percentage in the overall score. The Arc'teryx Alpha FL 45 ran away with the best ratio in both calculations, with and without the extendable collar used to measure volume. But the Hyperlite Mountain Gear 3400 Ice Pack was very close behind. The Patagonia Ascensionist and Black Diamond Speed 50 hold their own as well. The Ascensionist is comfortable when fully loaded, but the frame sheet can feel oversized and boxy with lighter loads. For this review, we measured the weight of the Osprey Mutant without the lid. Due to the increasing number of packs without lids at all, we felt the added weight was an unfair penalty to the Mutant, especially since the lid could be removed and the FlapJacket deployed, making it very similar in design and function to the Patagonia Ascensionist. There are two important components to mountaineering pack comfort — comfort on the approach and comfort on the climb. Smaller packs with flexible (or minimal) frame sheets tend to be much more comfortable on technical climbs than larger, beefier packs. Larger packs often have more substantial suspension systems, frame sheets, stays, and padding. These are usually much more comfortable on the approach than an overloaded fast-and-light pack but will feel cumbersome on technical rock and ice routes. We are seeing more and more mountaineering backpack models with flat back panels and simple suspension systems. Pack manufacturers are increasingly eliminating the lid and even the load lifter straps on top of the shoulder straps. At first, we were skeptical, assuming that this design would boost climbing performance at the expense of comfort on the approach. As we found out, this is not entirely true. First, let's point out that the more traditional Osprey Mutant 38 is still the most comfortable with heavy loads. It has a minimal frame, but it carries up to 50 pounds with ease (as easy as carrying 50 pounds on your back can be, anyway). But let's look at the surprising performance of our other two comfort winners, the Arc'teryx Alpha FL 45 and the Hyperlite Mountain Gear 3400 Ice Pack. Both of these have relatively flat and flexible, but firm frame sheets. They rest flush on your back and therefore move fluidly with you through any terrain. This contact with your back distributes some of the load, rather than focusing it on your hips and shoulders. They then add straps to tilt the weight one way or another to balance it. It's simple, and it works. Our physical therapist consultant approved of the comfort and support offered by the Alpha FL 45. To better help us understand why this works, we consulted with a physical therapist and climber who explained why this makes sense. To summarize, traditional packs with lumbar support push your spine into extension, which is a strong structural position for those unaccustomed to carrying a backpack. It doesn't work as well for fit, avid alpine climbers. It locks our bodies in one position, making it harder to move. Being able to flex allows us to fully exhale, rotate our torso more thoroughly, and tilt our pelvis backward, making high stepping much easier. This means you have to fight the pack less, saving energy. You can read more in our How We Test article. Another critical reason why these simple pack designs work is the concurrent increase in ultralight, durable climbing equipment — particularly sleeping pads, sleeping bags, and shelters. Add all of this together, and we can go further with less. Hustling to catch a plane on the Ruth Glacier was a breeze in the Mission 75, even when hauling a loaded sled full of gear (out of picture). Offwidths and mixed chimneys, bushwhacking, careless crampon use, stuffing bags to their gills — alpine climbing can subject a pack to all sorts of wear and tear. When our testers are in the mountains, they like to focus on climbing instead of babying their equipment. Fabric durability is rated using a "denier" number, which is the linear mass density of fibers. In other words, a higher denier number denotes a thicker, more durable fabric. A lower number fabric will be thinner and typically lighter weight. However, this rating doesn't tell the whole story. The primary durability determinant for mountaineering backpacks is their fabrics' abrasion resistance. Manufacturing technics, terms, and treatments can make this tricky to parse out. In general, most mountaineering packs use fabrics with adequate durability for alpine climbing. Some stand out above the rest, such as the impressively durable Arc'teryx Alpha FL 45, and some fall behind the curve such as the Hyperlite Mountain Gear 3400 Ice Pack with its easily-abraded Dyneema. Climbing the NY Gully on the north side of Mt. Snoqualmie, Washington. Mixed rock and ice means more opportunity to scrape your pack. Hyperlite Mountain Gear packs are made of Dyneema or Dyneema/polyester hybrid fabric models. Bare non-woven Dyneema (NWD, also known as Cuben fiber) is exceptionally lightweight, has tremendous tensile strength, and is waterproof. NWD's weakness is abrasion. For this reason, manufacturers using NWD often use it in a hybrid fabric, laminating it with a woven face fabric to improve abrasion resistance. The Hyperlite Ice Pack is constructed with a Cuben fiber/polyester hybrid fabric. Our tests found this to be less resistant to abrasion than the more traditional nylon fabrics in this review. Many pack manufacturers use fabrics with a lower denier on the sides and top of the pack to save weight. Then they put heavier, higher denier fabrics on the bottom, and on other high-impact areas where you may stow your crampons. Our testers find that, when climbing in typical alpine terrain, the sides of the pack get scratched up. It might be that the only part of a pack that isn't abused is the part that's against your back. Rugged enough for reasonable contact with rocks, the Ascensionist should last a good long while. For this reason, we like the consistently durable materials used throughout the Patagonia Ascensionist. We also appreciate the padding on the bottom, a common site for pack wear and tear. The Black Diamond Mission 75 is also an excellent example of simple durability with 420 denier nylon throughout. Of more concern in the durability department is the strain put on specific areas of the packs due to design and construction. We inspected each model for notable stress points, and any stitching that looked like it would give out over time. Will the compression straps tear out of seams under bulging loads? Does that initially cushy hip belt wimp out over time? Imagine a worst-case scenario — you arrive at the belay, clip your pack to the anchor by its haul loop, only to have that rip out, and your pack falls to the deck hundreds (or maybe thousands) of feet below. The Patagonia Ascensionist is an impressively durable pack for this reason as well. The entire suspension is sewn deep into the skeleton of the pack, making it one of the most solidly reinforced models we have tested. Among the most durable packs we reviewed, the Scrambler Outdry is a great climbing pack. One pack that stands out for its durability is the Mountain Hardwear Scrambler 30 Outdry. Mountain Hardwear eliminated a lot of features and instead focused on durable fabrics. We were often frustrated by the too-tight side pockets and the lack of a key clipper, but this pack is still an excellent choice for multi-pitch rock climbs, and remained higher in our regard than we would have suspected for its small size and lack of features. This was in large part due to its excellent durability. We knew we could count on this pack, whether biking through town or hanging hundreds of feet off the deck. Among the most versatile packs we've tested, the Ascensionist is ready for a range of mountain missions. Our testers ask a lot of their climbing packs. We want them to be comfortable hauling loads on the approach like a backpack, and then not hinder our movement once on the route, like a climbing day pack. We scored each pack based on its ability to adapt. Versatility also helps you decide if you need to buy three packs for all your adventuring needs, or if you can get away with one Jack- or Jill-of-all-trades. The chart below shows where each pack ranked in the versatility metric. The Patagonia Ascensionist 40 and Osprey Mutant 38 ran away with top scores for versatility. The Ascensionist's wide, easily cinched mouth make it a great for day-to-day cragging and expeditions alike, and it is burly enough to stand up to mountains of abuse. The Mutant scores so well due to impressive comfort hauling heavy loads and its ability to shift effortlessly onto technical terrain. If you tend towards shorter trips, we'll steer you towards the Patagonia. The Osprey does better when slightly overloaded. Some packs allow you to remove the frame sheet to reduce weight or to use as an emergency foam sleeping pad, a feature we liked in both the Patagonia Ascensionist and the Black Diamond Mission 75. This feature is seemingly not as common as it used to be, likely because pack manufacturers are finding other ways to improve the comfort-to-weight ratio. For larger models, this can be an excellent feature to know about. We especially liked this feature on the Gregory Denali 100 since you will want to take a foam pad with you on summit day on most high altitude expeditions. This is integrated into the Denali and means one less item to add to your summit pack. Though the process to strip down the Mission 75 took longer than others — it resulted in a very streamlined summit pack that climbed well. The Mission 75 can be stripped down for summit pushes with its removable lid, framesheet, and hip padding. Some manufacturers went overboard while trying to make their packs more versatile. For example, the Mammut Trion Pro has two different ways to attach two ice tools or axes, which adds weight. The Trion is certainly a decent pack for everything you might want to do in the mountains, but its many features add weight as well as carrying comfort. Everything is a compromise on this pack, and it is optimized for nothing in particular. (Though it does have a distinct lean toward snow sports with the external zipper pocket that makes sense for avalanche rescue gear). Enjoying some high-quality ice with the Arc'teryx Alpha FL 45, our Top Pick for Fast and Light adventures. Simplicity is a great feature in a climbing pack. Well-designed alpine climbing packs more streamlined than your standard backpack. Unnecessary features add weight and complexity while giving you more things to break. For this reason, we gave points to packs that offered only the necessary features. Our favorite was the Black Diamond Speed 50. On the flip side, as long as pack features are useful and don't detract from functionality, we rate the pack highly in this metric. As such, Osprey hits it out of the park — or, climbing gym — with the Mutant 38. Osprey has a long history of making packs with an excess of features, often to the dismay of climbers who want a simple cylinder with minimal straps. The Mutant has both surprised and pleased many climbers and mountain guides, allaying years of accumulated skepticism with the well designed, durable, versatile, and impressively comfortable Mutant. The Mutant has a collection of well thought out features, from gear loops and streamlined side straps to pick holsters and T-bars that allow you to deploy your axe one handed, without taking the pack off. The Patagonia Ascensionist provides some competition though, boasting a lighter weight per volume than the Osprey, and retaining a lot of the useful features we like in the Mutant. Watch out Osprey. There's competition on the horizon! Finding the ideal mountaineering backpack for your needs is a complex algorithm. The metrics we use in this review weigh several of the most important qualities of a mountaineering pack. We compare them, side-by-side, as objectively as humanly possible. Objectivity is inherently somewhat of an illusion, so we hope that our descriptions of our experiences in the field help you to home in on the pack of your dreams. Keep in mind that our top scoring packs may not perfectly suit your needs. Be sure to check out packs that score highest in the categories you care about the most. We have also included a wide variety of pack types in this review, but our metrics still reflect a solid performance. For example, an expedition pack isn't disadvantaged for being bigger. We assess relative sizes by looking at weight-to-volume ratios to hone in on the quality of materials and thoughtfulness of design. Standing on top of Europe with energy to spare thanks to the streamlined efficiency of the Mission 75. Mt. Elbrus, Caucasus, Russia.